This was my first stab at a digital-out balanced-input microphone preamp using a very low noise input stage op-amp, the AD797. 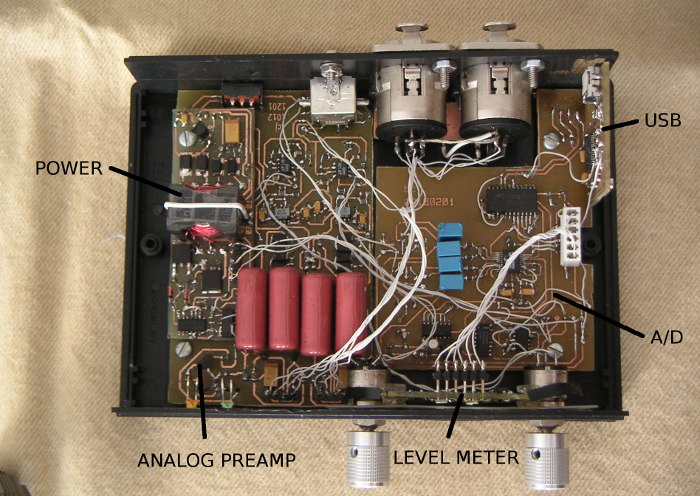 When I started out, the aim was first to have a preamp with an analog output suitable for feeding to a sound card, with a DC/DC converter that would run from 5V and provide rail voltages for the op amps as well as phantom power. 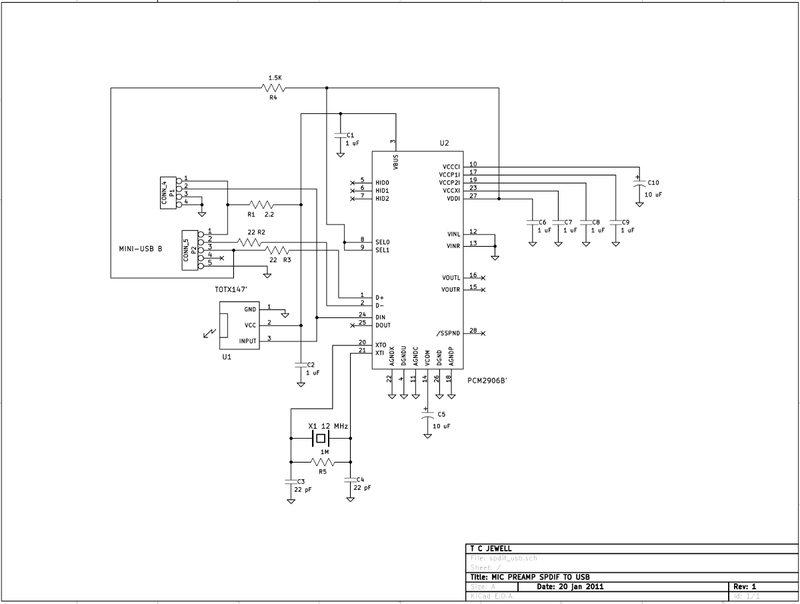 Building my own, I could design it with no electrolytic capacitors in the signal path. Then I would move on to providing an A/D section and eliminating the sound card. The interesting part of the preamp board is the second stage, which uses an op-amp in inverting configuration with a fed-back negative resistance provided by another op-amp to provide pseudo-logarithmic gain control using a linear pot. 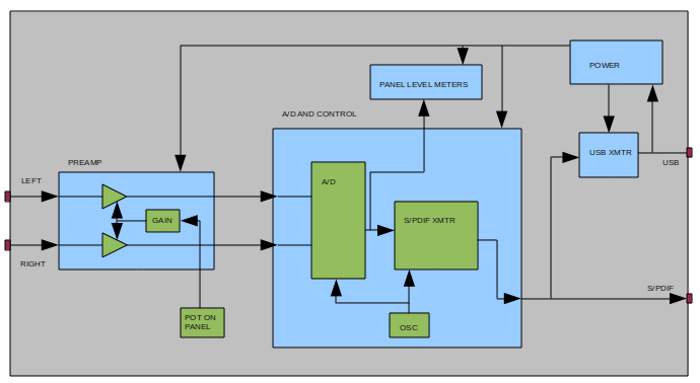 This circuit has the additional advantage of delivering a balanced output to drive the balanced inputs of the A/D converter. I then added an A/D converter board that used two now-obsolete Crystal/CIrrus parts, the CS5360 24-bit A/D converter and the CS8402A S/PDIF transmitter, with the aim of using the preamp with the optical (TOSLINK) input of a sound card. Eventually I realized that USB would be more convenient for portability than S/PDIF, and I found TI's PC2906B 16-bit S/PDIF-to-USB converter (that's not what they call it, but that's what I use it for). 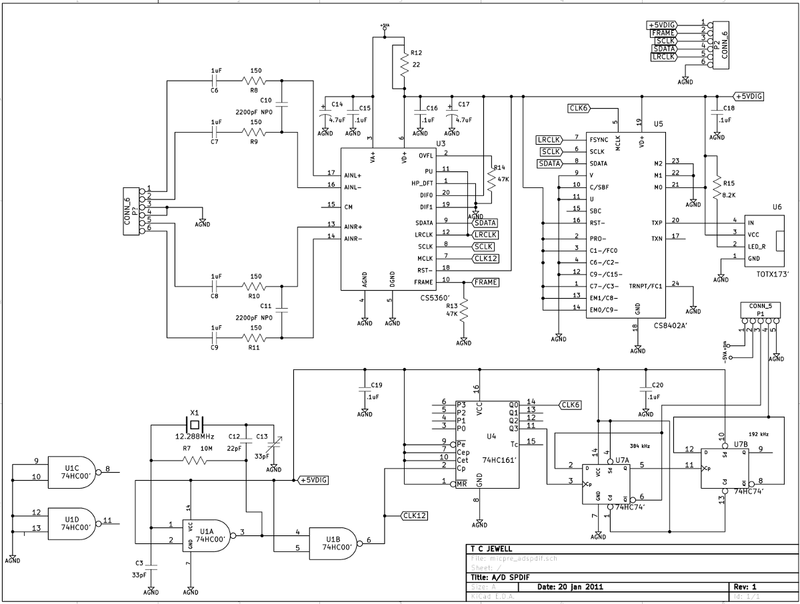 This of course limited the output to 16 bits rather than 24, and introduced the possibility of noise coming in through the USB connection. Noise coming in on the USB power line has not turned out to be a problem. I've made comparisons between the preamp set up with USB output, and then set up with optical S/PDIF output with an independent, isolated power supply, and found no serious difference (neglecting harmonics of 60 Hz coming from the independent power supply!). Noise spectrum at full gain. 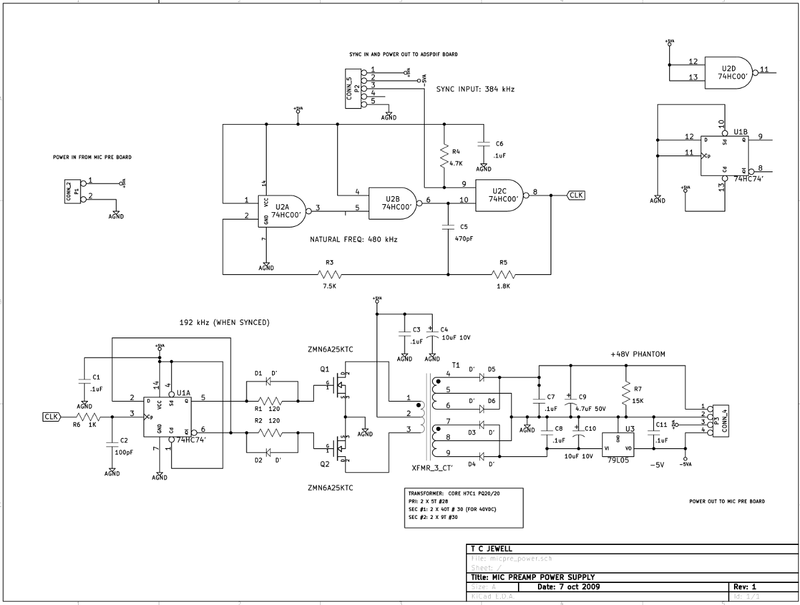 This is the gain of the input stage, 29 dB, plus the gain of the A/D driver stage, 55 dB, for a total of 84 dB. 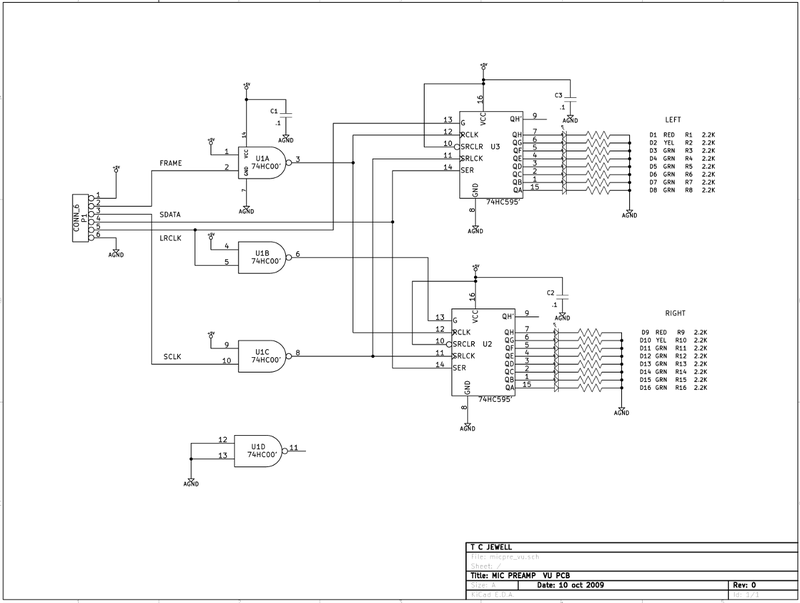 In this last plot, the noise from the AD797 input stage is visible. 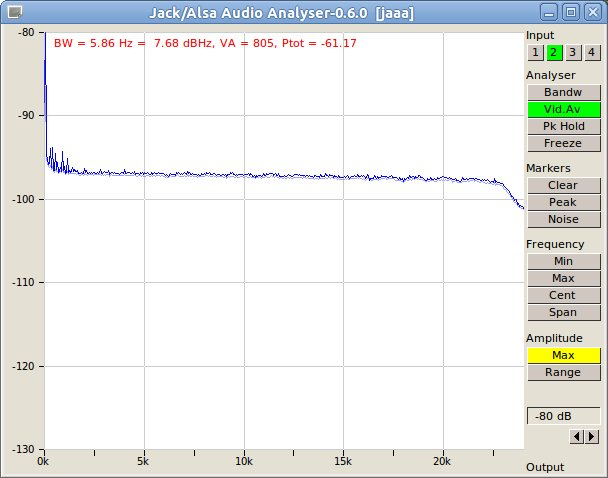 The AD797 claims typical noise of .9 nV/root Hz from about 1kHz on up. 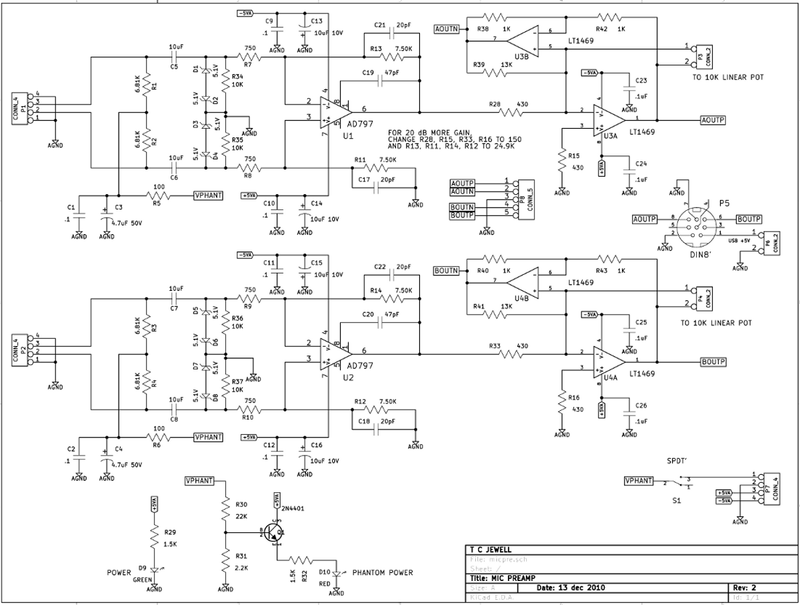 Amplified by 84 dB, this is 14 uV/root Hz going into the A/D converter, which has a full scale input of 2 V rms. The spectrogram above shows data analyzed at a bandwidth of 5.86 Hz, and multiplying the 14 uV/root Hz by the square root of 5.86 Hz/1 Hz yields 35 uV in 5.86 Hz. 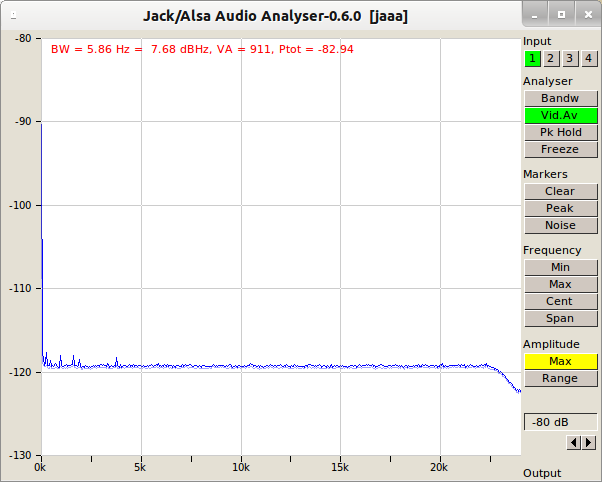 This is 95 dB below the 2 V rms full scale input of the A/D, and that is what's shown in the plot above. With a condenser microphone, the gain is likely to be set some 40 dB below this maximum. This puts the noise from the input stage below the noise shown in the first plot. The reason for such a high gain to begin with was to accomodate a very low output dynamic microphone. But even with a dynamic microphone, the gain will never be set to full.